British bulldogs. Singer Adele’s got one, Winston Churchill resembled one (allegedly!) and they have been popularly used to represent England and the UK for years. 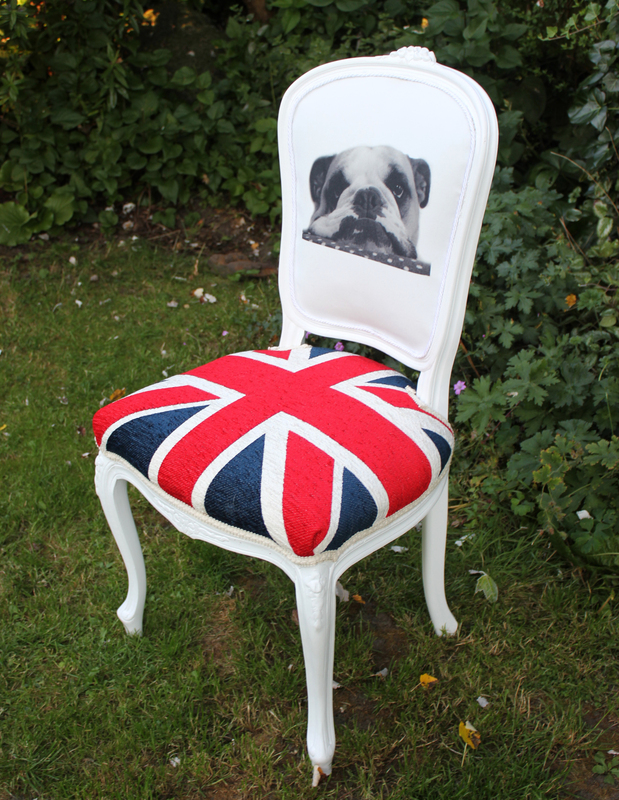 Now bulldogs are all over the most stylish of interiors. To Joanna, it seemed like the perfect solution to include Watson and Rosy in her work, as they “will do anything to make sure they are the centre of the universe – they are both such attention seekers!” She’s had a great response already to her designs and, as each one is unique, her clients are delighted to own a piece that cannot be found anywhere else. Although Joanna doesn’t usually create pieces featuring her clients’ own pets – she has to be careful with the images she uses, as quality is paramount – we’re delighted that she’s extended her services to all Mighty Pooch clients. Simply send Joanna one of your professional photographs from your MP photoshoot and she will create a unique piece featuring your own canine chum. Coming soon to The Mighty Pooch blog: Bulldog couture part 2! Great chair, and very original!